The Eddy County commissioners convened this morning to discuss ordinance prioritization, special commission meetings, and recommendation for the new flood commissioner in what might have been be the quickest county commission meeting on record. Multiple service awards and one retirement recognition began the meeting. Michael Melton, Cheryl Winfield and Fedrick Kezar were given service awards, Melton for five years with the detention department, Winfield for 10 years with the assessor’s department, and Kezar for 10 years with the public works department. 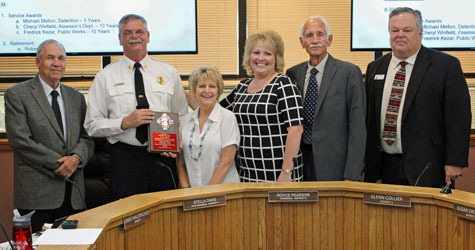 Robert Brader then announced his retirement as fire service director and county fire marshal after nine-and-a-half years on the job. Brader was given a plaque honoring his near-decade of service to Eddy County. Afterward, the commissioners recessed and reconvened as the Indigent Hospital Claims Board to approve that board’s consent agenda, which contained Indigent Hospital and County Health Care Claims Board minutes and indigent hospital claims. Rudometkin came to the commission on behalf of Wesley Hooper of the Community Services department, who was absent, in reference to the ordinance prioritization of the Planning and Development Committee. As presented on the agenda request, priority was given to abandoned water wells first, junkyards second, and man-camps third. Originally, there was a fourth ordinance listed, and that was “commercial use in residential areas.” The commissioners’ recommendation was to move junkyards to the first priority, keep the rest of the prioritization list as written, and add commercial use in residential areas as the fourth priority. 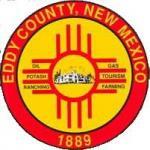 Next on the agenda was a request for approval to begin the process of adopting the Eddy County Mobile Home Ordinance. The Planning and Development Advisory Committee has completed their review of the Mobile Home Ordinance and have recommended holding two public meetings, the first in Artesia at 5:30 p.m. June 29 and the second in Carlsbad at 5 p.m. July 6. The meetings will review the regulation of the placement, construction and maintenance of structures within the county. The locations of the meetings will be determined at a later date. “These are public meetings to gain interest, ideas and comments,” said Rudometkin. The commissioners also voted to approve the reclassification of the Code Enforcement Manager to Code Enforcement Officer given the recent hiring of Steve McCorskey into the planning position staff. This reclassification will save the county a total of $3,993.60. Robin Van Natta, county clerk, came before the commission to ask that they organize a series of special commission meetings regarding open and closed primary election canvassing on June 8 and June 13. The commissioners voted to approve these meetings. Since current Flood Commissioner Louise Tracy announced her retirement at the last commission meeting, the commissioners chose two people to recommend to Gov. Susana Martinez to fill the position: Joe Pemberton and Jon Tully.